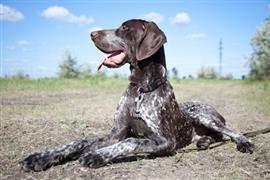 Owners of German Shorthaired Pointers select various names for a variety of reasons. Some German names closely rooted to the breed’s country of origin include Hans, Fritz, and Gretel. The GSP was bred to be both a family dog and a gundog. Some names related to guns include Rifle, Caliber, and Bullet. Other typical hunting options include Forest, Staunch, and Trophy. Good family dog names are easily found and can be borrowed from other family dogs. While borrowing your neighbor’s dog name is probably a bad idea, there have been plenty of dog names that have popped up in television over the years that are less likely to leave you serving dinner for two. Eddie (‘Frasier’), Comet (‘Full House’), and Vincent (‘Lost’) are few television inspired ideas. Finding a good country name for a country dog is as easy as choosing a theme. Cash crops is one unique theme that yields names like Olive, Peanut, and Maize. Some of our pages will contain a subcategory. A subcategory is a slightly more specific grouping than the main topic of the page. For a subcategory, we will include a separated table of names and corresponding descriptions. An example of a subcategory of Red Dog Names would be 'Dog Names Inspired by Red Wines'. If you have any subcategory ideas for the German Shorthaired Pointer Names page, we would love to hear them. Use the form below to submit your ideas.